Inspirational and heartfelt, gorgeous Romantic piano masterworks, some rarely available to the audiences, in a unique combination with six soul searching poems. Yelena Balabanova has performed as a soloist, accompanist, and chamber musician in numerous festivals and concerts, including Steinway Hall, Benaroya Hall, a four-year tenure at Colorado Music Fest, and tours across the United States, Russia, and Europe. A native of the Moscow region of Russia, Yelena Balabanova began her musical training at the age of four, received her Bachelor’s piano performance degree at the age of 19 in Moscow, and was awarded the Doctor of Musical Arts degree from the University of Colorado at Boulder, where she studied with Larry Graham and Robert Spillman. Dr. Balabanova taught at the State School of the Arts in the Moscow region of Russia, at Virginia Polytechnic Institute and State University, University of CO at Boulder, and at the Renaissance Music Academy of Virginia. Yelena loves to share her passion for piano with her community and students of all ages through teaching at the International Conservatory Studio in Bellevue and Seattle, WA, and Colorado Springs, CO. She is a sought-after presenter of workshops and master-classes, and enjoys coaching and creating performance opportunities for other musicians as Artistic Director of Soli Del Gloria concert series in Bellevue, WA. She currently serves as WSMTA Chairman for the Arts Awareness and Advocacy. In 2010, Yelena joined a team of ten pianists, the “Ten Grands” Project, which raised 2 million dollars to support music education in public schools and communities. Dr. Balabanova and her students have been recognized with numerous national and international awards, including the National Recognition Certificate from the National Foundation for Advancement in the Arts. 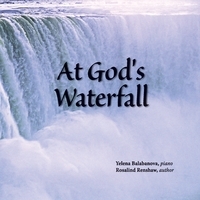 Rosalind Renshaw has been inslired to write about her spiritual journey for over 25 years. It has been an unexpected joy to find that her poetry speaks to the hearts of many others, encouraging and challenging them to grow in their own walk of faith. Rosalind grew up in England. Her journey to "find herself" took her all around the world and eventually Rosalind began anew life in California. She took a leap of faith when in 1989 she responded to God's invitation to enroll in Fuller Theological Seminary in Pasadena. Upon graduation Rosalind was called to First Presbyterian Church of Bellevue,WA, and ordained in the Presbyterian Church(USA). her family moved to the Pacific Northwest and Rosalind found a place to flourish at FPCB as the Associate Pastor for Singles and Fellowship Ministries.